Commander Baba (known as Baba Aabuddin) from Andarab district. He is now active in Pul-i-Hesar District (20110109) Prominent by Taliban defeated HIA leaders in Baghlan Province were Mamor Malang, he is the second biggest Commander in Baghlan Province. Abdullah [killed in a fight with police in the Karkar mine area of Pul-i- Khumri] (known as Kalakof) from Central Baghlan District, Commander Mohammadullah, Noor Agha, Sher, Mirwais, Noorullah (20100309), Gul Rahman from Andarab District, Rahmat Shah from Broka Nahrain District. Koh Chinar, Qaisekhel and Qashq-i-Ghulam areas are under control of the Taliban now (20100300). Taliban disarmed 20 HIA men in the Dehna Ghori District Dahana-I-Ghori District. 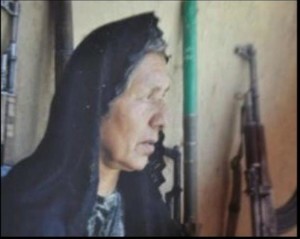 Female Commander Bibi Aysha alias Kaftar "the pigeon" (native Nahrin district) was an active commander of Jamiyat-a-Islami during former USSR (Russia) invasion of Afghanistan; she fought against Taliban in Nahrin district during their regime and was Nahrin district representative in emergency traditional council (Loya Jirga).The Commander of an armed group in Baghlan province is woman, aged 60 and her name is Kaftar, known as “Commander Kaftar”. This commander is still involved in wars with rival groups.Former security officials of Baghlan province charged her (Commander Kaftar) for killing 3 policemen and a Jihadi commander and armed robbery but she once more joined government four years ago. Commander Kaftar once again has armed her group and started armed conflict with two former Jihadi Commanders, local officials of Nahrin district said. (20111217) Having 30 armed supporters, Kaftar has been active mostly in Barka district since the Jihad era. In severe fights between 20100306-20100309 Taliban defeated several HIA Commanders in their traditional HIA-Strongholds in the northern Baghlan-i-Markazi District of Baghlan Province. 120 Hizb-i-Islami Afghanistan (HIA) fighters handed in their weapons and surrendered to the government in northern Baghlan province and asked for protection.